Make 5 Minute Easy Chocolate Bark over 6 different ways with only 2 main ingredients! It’s the perfect gift for the holidays. Will you start with dark chocolate or white chocolate? Speaking of movies that are inappropriate, what (older) movies should I be watching with her? I’m thinking those cult movies we all loved from the 80s and 90s…we already watched Breakfast Club, Clueless, and Mrs. Doubtfire. Three Men And A Baby is on my list…but I know there are others she’ll get a kick out of. She’s almost 12 and we allow up to PG-13 (again, sans violence). There comes a time during parenting that you just cannot watch Disney Channel any more. No more cartoons or whiney brats or silly tween dramas; I reached the point about a year ago that I need real movies and TV shows during family TV time. But I need more ideas…so leave some in the comments! 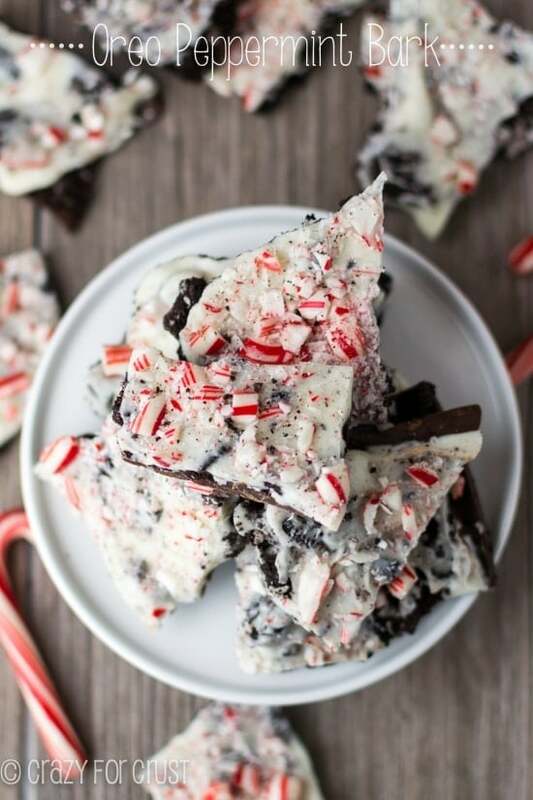 One of our favorite things to snack on over the holidays is chocolate bark. It’s SO easy to make (Jordan often makes it herself without any help) and everyone loves it. Plus, it’s easy to cater to everyone’s likes. With this simple, basic, EASY bark recipe (only 2 main ingredients!) 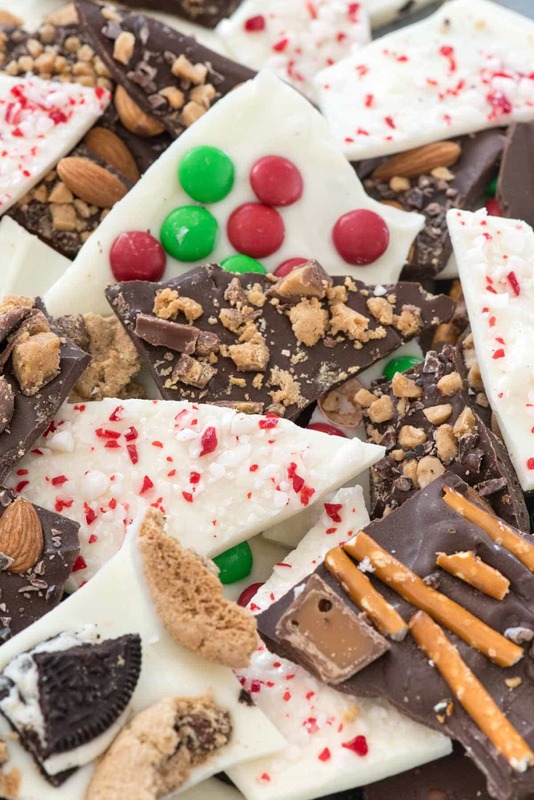 you’ll have chocolate candy bark success every time. I often call bark my “clean out the pantry” dessert because that’s basically what I do when I’m coming up with flavors: I search through my baking cabinet with half used bags of candy or the dregs of the sprinkles or cookie boxes. EVERYTHING goes good with chocolate and it’s easy to personalize the recipe. Does your holiday gifting list prefer milk or semi-sweet chocolate? 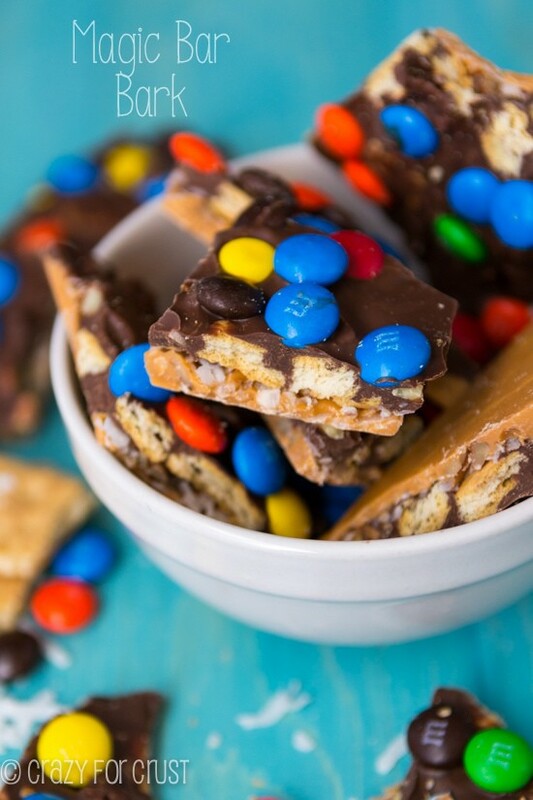 Great – make them chocolate bark with peanut butter cups. Maybe dark chocolate is something you love? Well, then almonds and toffee with dark chocolate are where it’s at. And don’t worry; I haven’t forgotten about white chocolate either. 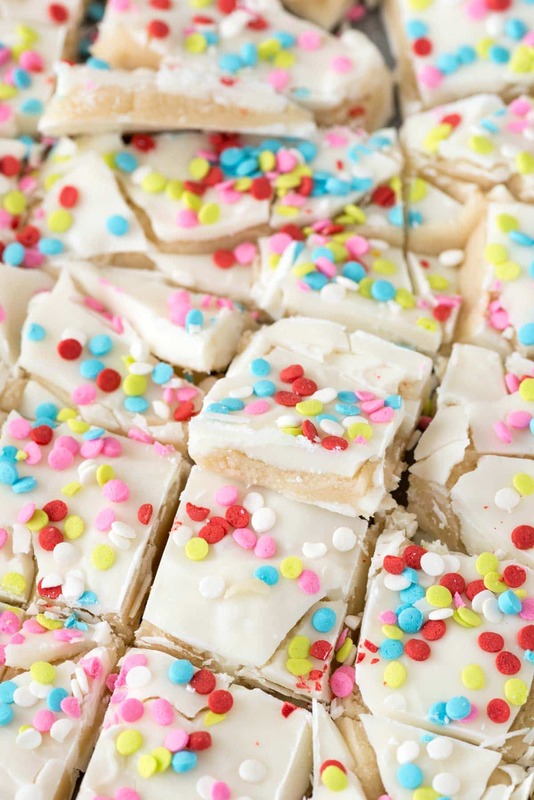 White chocolate is great with crushed peppermint candies, M&Ms, or even with chopped cookies (like cookies and milk!). The sky is the limit on the flavors and combinations you can make. Really, the recipes I list are just some ideas. Take them and run with it – think of some of your favorite. The two basic ingredients you need to make chocolate bark are: chocolate chips and oil or shortening. You can use any chocolate you like, really (like almond bark or good baking chocolate) but I’m pretty sure that 99% of the world has chocolate chips in their pantry, especially this time of year. If you need a quick treat or party dessert or gift, it’s super easy to grab the chocolate chips and get to making bark. I always add Crisco vegetable oil or vegetable shortening to my chocolate chips before I melt them. This goes for bark or for any time I melt them, really. Have you ever tried to microwave chocolate chips (especially white chocolate) and they seize and get ruined? Even if you are careful about the container you melt in or the temperature, sometimes chocolate chips just have trouble melting. Using oil or shortening will greatly reduce the risk that this will happen. In fact, I’ve never had chocolate chips seize on me when I use one of the two. The other thing I always do when melting chocolate chips is to do so in the microwave on 50% power. It takes longer to melt, but it helps them melt slower and reduces the risk of seizing. I also like to use paper bowls (easy clean up) or those reusable plastic containers. My least favorite for melting are glass or porcelain bowls; those get too hot and can ruin your chocolate. Once you melt the chocolate, you just have to spread it out into a thin layer and then you add your toppings. Cookies, candy, nuts; the sky is the limit. What will you use? Make 5 Minute Easy Chocolate Bark over 6 different ways with only 2 main ingredients! It's the perfect gift for the holidays. Line a 10x15-inch pan or cookie sheet with wax paper. Place chocolate chips in a microwave safe bowl. I like to use a disposable paper bowl or re-usable plastic container for best results. Add shortening or oil. Heat chocolate chips on 50% power in 30 second increments, stirring between each, until melted and smooth. Spread chocolate into an even layer on the prepared pan. Top with desired toppings. Chill to set then break into pieces. Store in an airtight container in the refrigerator for 4 days to 2 weeks (depending on the toppings you use; candy toppings last longer than pretzels or cookies, which tend to get stale). 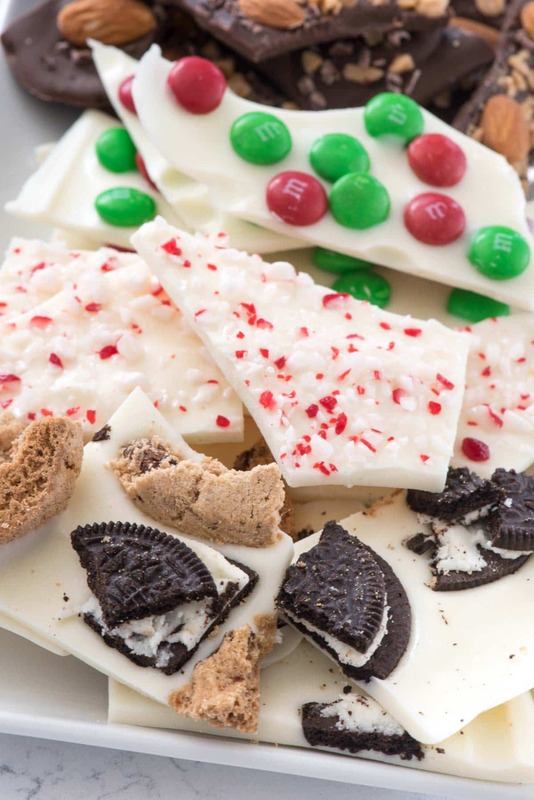 Peppermint White Chocolate Bark: Sprinkle chopped candy canes or peppermint crunch over melted white chocolate. M&M Chocolate Bark: Sprinkle holiday or any flavor M&Ms over melted white or regular chocolate. Milk & Cookies Bark: Sprinkle chopped chocolate chip cookies and/or Oreos over melted white chocolate. Peanut Butter Cup Bark: Sprinkle chopped peanut butter cups over melted milk or semi-sweet chocolate. 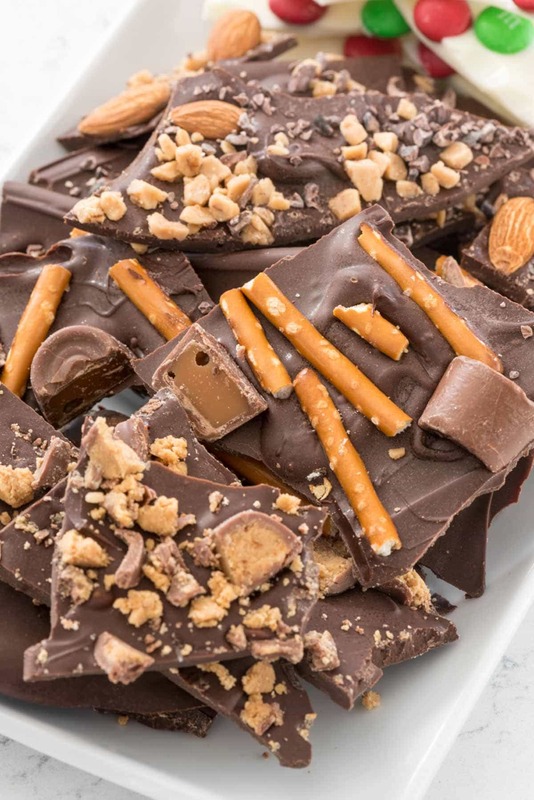 Caramel Pretzel Bark: Sprinkle chopped pretzels and Rolos over milk or semi-sweet chocolate. Almond Toffee Bark: Sprinkle almonds, toffee bits, and cocoa nibs over dark chocolate. These are just a few ideas - there are so many options! Clean out your baking pantry and make your favorite flavor combo! This post was created in collaboration with Crisco. The Facebook & YouTube videos were sponsored by Crisco. All opinions are 100% my own. I’m so glad someone beat me to it, but you have to watch Adventures in Babysitting and also She’s Out of Control. Those were my two absolute favorites that I would ‘rent’ when I was her age. Of course I had a boy after and my daughter has special needs that won’t allow her to understand the movies so I can’t pass them on. Enjoy!! OMG She’s Out of Control. I LOVED that movie!! I totally forgot all about it. I’ll have to try and find it. Had no idea it was that quick and easy! I too am a grandmother so classics are a must. Any of the Cary Grant Katherine Hepburn movies The Thin Man Series Going My Way Meet Me In St Louis Rogers and Hammerstiens Cinderella with Leslie Warren. This was a special treat to watch once a year. I still can remember most of the songs lol. For a little newer movies The Last Unicorn Iron Giant Neverending Story The Last Starfighter Darby O Gill and the Little People Jumanji Goonies Hope you and your family get as much enjoyment out of some of these movies as we readers get out of your wonderful recipies. What size pan? You say “prepared pan” but I don’t see where you say how to prepare it, unless I missed it. Just saw your recipe! I know that it’s been almost 2 years since you posted it, but I wanted to suggest I Love Lucy re-runs. We bought them on eBay, and our children love watching them. They are hilarious, and good, clean fun. Even our high school age kids enjoy watching them! Thanks for the delicious recipes! I made it today and can’t remember how long it took to set so I can cut into pieces. By the way, everyone loves when I make this at Christmas time. Thank you for this recipe oh, I made chocolate work last year and it was a big hit, but I couldn’t remember where I found the recipe! But why is Christmas Vacation a bad movie? It’s number one on our list! Opening up a whole new world! Did not harden into bark, more like a jelly rollup.